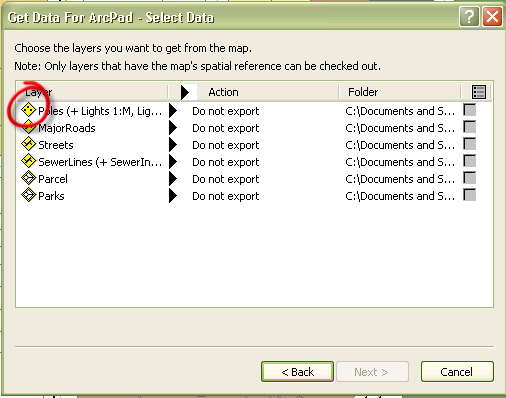 Have you ever noticed that the Riverside sample has different icons displayed from the symbology on the QuickCapture toolbar and Table of Contents for the some of the layers? Ever wondered how easy it is to put them there? Of couse you have! 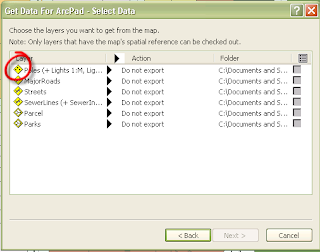 In the ArcPad Data Manager on the "Select Data" page, feature layers from your map are listed with a yellow symbol indicating the feature type (point, line or polygon). If you use your mouse and click the symbol that you want to change, the select icon dialog will appear. Simply navigate to the location where you have an icon stored and select it.